We specialize in the growing of topiary shrubs and Bougainvillea. Our goal is to provide the healthiest, heartiest plants possible. We accomplish this by beginning with superior varieties, using the highest-grade soil mixes and fertilizers, and then shaping and pruning each plant by hand. Bougainvillea Color Varieties * Reds and Pinks: Barbara Karst, Helen Johnson, Miami Pink, Imperial Thai Delight, James Walker; * Purples: Elizabeth Angus, New River, Silhouette; * Oranges and Golds: Sundown Orange, Gold, Flame; * Whites: Mauna Kea, Seafoam, Barbara Karst/Seafoam Combination ("Santa"). Planted Sizes 2.5 qt. Bush (Planted height 6-8in) 2 Gal. Bush (Planted height 12"-14") 1.5 Gal. Hanging Basket (Planted height 10"-12") 2 Gal. Patio Tree (Planted height 28") 2.5 qt. Trellis (Planted height 12-14") 2 Gal. Trellis (Planted height 22"-24) 5 Gal. Trellis/Column (Planted height 42"-46") BOUGAINVILLEA CARE: Tips for Vibrant Color. To help your Bougainvillea achieve its full color potential during season, follow these simple steps: * Regularly feed your plant with a balanced fertilizer high in iron and other micronutrients; * Ensure proper watering by using this simple rule of thumb: If few leaves, but some color - not enough water; If lots of leaves, but little color - too much water; If a combination of healthy leaves and color - just right; * Maximize color by "pinching" or pruning the ends of your Bougainvillea after each bloom cycle, since Bougainvillea will only show color on new growth. 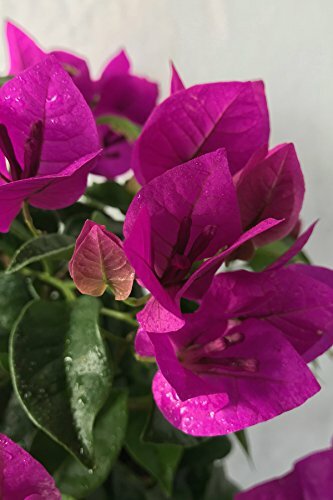 WATER: Bougainvillea are drought-tolerant, requiring infrequent watering once established. Bring the soil to visual dryness, and then water the soil thoroughly (avoid frequent, light watering since this will promote a weak and shallow root system). We specialize in the growing of topiary shrubs and Bougainvillea. Our goal is to provide the healthiest, heartiest plants possible. We accomplish this by beginning with superior varieties, using the highest-grade soil mixes and fertilizers, and then shaping and pruning each plant by hand.